The Peanuts were also an omnipresent on Japanese television in the 1960s. They made numerous appearance in the U.S. and Europe, as well. Readers might recall their rather odd recurring role as miniature fairies in the Mothra monster movies. The Peanuts’ music holds up remarkably well today: terrific harmonies, attractive arrangements, and excellent choice of material. I thought about including a chapter on them in my book, Sayonara Amerika, Sayonara Nippon: A Geopolitical Prehistory of J-Pop, but in the end ran out of time. Maybe someday I’ll get around to writing about them: they are essential figures in the history of Japanese popular music. UPDATE: A friend has sent along a link to this wonderful clip, a collection of scenes from “Shabondama Holiday” (Soap Bubble Holiday), the 1960s tv show that featured The Peanuts. When I was a young man growing up in Minnesota, theater was a part of daily life. All through high school and college, I acted in plays and volunteered at local community theaters. I dated a few actresses along the way, too, which brought me to even more cast parties and opening nights. Even when I wasn’t directly or indirectly involved in the production, I attended local theaters on a regular basis. Then came life, and grad school, and kids, and the weight of the world. You could probably count the total number of plays I attended in the 1990s and 2000s on the fingers of two hands, and you wouldn’t need to call on the thumbs. But in the last six months, that’s all changed. Thank you, sabbatical. In late December, as a Christmas present, I bundled off the whole family to see the Drury Lane Theatre’s acclaimed local production of “The Sound of Music.” It featured what one local critic declared a “star-making turn” and “a candid, delightfully impulsive, expertly sung performance” by Jennifer Blood as Maria. The children in the cast also acted and sung with remarkable poise. It helped remind me that I really do love a good musical. Then in early April I was in New York City for meetings and managed to catch the celebrated (and subsequently Tony Award winning) production of “Death of a Salesman” at the Barrymore Theatre. Directed by Mike Nichols and starring Philip Seymour Hoffman, the production recreated Jo Mielziner’s set design and Alex North’s audioscape from the original 1949 staging. I have real problems with Arthur Miller in general: the overweening earnestness of his scripts rubs me the wrong way. And it took a few minutes to adjust to the uncomfortable silences (deeply thoughtful? blankly thoughtless?) that Hoffman etched into his portrayal of Willy Loman. The rest of the cast wasn’t as strong as Hoffman, but as the evening wore on, I found myself wrapped up in the tragic, awful story. Yes: the bowels of my emotions were appropriately purged. Yando is giving one of the great performances of his long Chicago career — the great performance, I’d say. He captures all the necessary sides of the nasty-but-compelling politico: his cynicism, malevolence, intelligence, sexuality, love of power, formidable insight into the baser aspects of human nature and his sense of humor. He is funnier than Al Pacino in this role and just as mercurial. He has a deeper sense of the man’s horror at his own mortality. And, above all, Yando’s Cohn is spectacularly present and alive. We saved the best for last, it turned out. Last week we attended the Goodman Theatre’s production of “The Iceman Cometh,” starring Brian Dennehy and Nathan Lane. I have to agree with the New York Times‘ Charles Isherwood: “Mr. Falls’s superbly cast production contains as many great performances as I’ve seen in a single show in years, certainly more than I saw in any Broadway show of the past, imperfect season.” It says something that Nathan Lane was the weakest link in the cast, and he in fact turned in a fine performance. The play itself is flawed (the last act, for example, includes an impossibly long monologue), yet I was willing to yield to O’Neill’s (and, for that matter, Tony Kushner’s) vision of the world in way that I just can’t for Arthur Miller. My father was raised in Minnesota during the 1940s and 50s. This predated the rediscovery of F. Scott Fitzgerald, and so Sinclair Lewis, winner of the 1930 Nobel Prize for Literature, was the celebrated hometown author. I remember visiting Lewis’s boyhood home in Sauk Centre during a family vacation in the late 1960s and I can vividly picture the squat pocket-sized editions of Lewis’s novels in Dad’s bookshelf: Babbit, Main Street, Elmer Gantry, Arrowsmith, Ann Vickers…. I read them all as a teenager. I was particularly struck then by Dodsworth (1929). It was likely the very first rendition of the jaded-American-reawakens-in-Europe plot I ever encountered, and it seemed quite brilliant to me at the time. Sinclair Lewis’s stock has fallen considerably in the last few decades. It had been many years since I read him, but this summer I picked up (more precisely, downloaded) a copy of Dodsworth. I returned to it after this long absence with a sense of curiosity: would it still speak to me as powerfully as it did when I was sixteen? The answer: yes. The novel feels dated in places. There is a misogynistic tinge to the portrayal of Fran, Dodsworth’s narcissistic wife, and there is some gay-bashing and some discomfiting ethnic stereotypes–though not as cringe-inspiring as in many other works from the period. If she was an angel, the girl at whom Sam was pointing, she was an angel of ice: slim, shining, ash-blonde, her self-possessed voice very cool as she parried the complimentary teasing of half a dozen admirers; a crystal candle-stick of a girl among black-and-white lumps of males. What really strikes me, though, is Lewis’s portrayal of his hero Dodsworth, a type of man that Lewis must have despised. Samuel Dodsworth was, perfectly, the American Captain of Industry, believing in the Republican Party, high tariff, and so long as they did not annoy him personally, in prohibition and the Episcopal Church. He was the president of the Revelation Motor Company; he was a millionaire, though decidedly not a multimillionaire; his large house was on Ridge Crest, the most fashionable street in Zenith; he had some taste in etchings; he did not split many infinitives; and he sometimes enjoyed Beethoven. He would certainly (so the observer assumed) produce excellent motor cars; he would make impressive speeches to the salesmen; but he would never love passionately, lose tragically, nor sit in contented idleness upon tropic shores. We plumb the depths with Dodsworth and experience the despair of his middle-age crisis. We watch his marriage disintegrate. But then we gradually float back to the surface with him, as he reawakens to the joy and possibilities of life, thanks in large measure to the “contented idleness” he enjoys during a sojourn amidst the humane culture and earthy landscape of Naples. Lewis depicts Dodsworth’s decline and rise with remarkable sympathy, complexity, and good humor. We can’t help but like this Dodsworth, for all his bullheaded dundering. It is a novel, finally, about a bully’s redemption. How many of those do we have? We moved to Chicago in 2007, and I’ve made it to the Blues Festival every summer since. It’s become an increasingly melancholic event: the artists I looked forward to seeing every year have been falling away, one by one. Pinetop Perkins, David “Honeyboy” Edwards, Willie “Big Eyes” Smith, Hubert Sumlin…. Every festival, it seems, another familiar face is missing. We arrived in Grant Park late yesterday afternoon for this year’s edition. The weather was hot and sunny, the crowd huge and (as always) a crazy quilt of humanity–all ages, sizes, colors, styles and shapes. On top of everything, the Blues Festival provides some of the most intriguing people-watching you’ll find anywhere on earth. We caught the last couple of numbers from Patrice Moncell’s set. The Mississippi-native unleashed a version of “Strokin'” so ribald it would have made Chaucer blush. She followed it up with a sweet jazz number that proved she could also be a finely nuanced singer. Very nice. This was followed by a tribute to the late Koko Taylor, with strong sets by Melvia “Chick” Rodgers, Jackie Scott, and Nora Jean Brusco, all backed by the reunited Koko Taylor Blues Machine Band. Rodgers closed the set with a high-energy take on “I’m a Woman,” Taylor’s rebuttal to Muddy Waters. Finally came the headliner: Chicago legend Mavis Staples, now Dr. Staples thanks to the honorary degree Columbia College awarded her a couple of weeks ago. Backed by a crackerjack three-piece band and a trio of excellent backing singers, Staples put on a remarkable show. I can’t think of another musical performer who brings the same degree of moral authority to the stage with her. Highlights included “The Weight” (which turned into a tribute to the late Levon Helm), “We’ll Get Over,” “Freedom Highway” (including some pointed political commentary about contemporary racism and Barack Obama), and the title track from her marvelous 2010 album, “You Are Not Alone.” She also tossed off a seemingly impromptu cover of Koko Taylor’s signature number, “Wang Dang Doodle.” Staples closed the evening with a thrilling “I’ll Take You There,” the massive crowd standing and singing along. Dave Hoekstra wrote a nice review of the evening for the Sun-Times. And here’s some fan video from Mavis Staples’ set. Note the way she speaks between numbers: even her spoken introductions overflow with musicality. 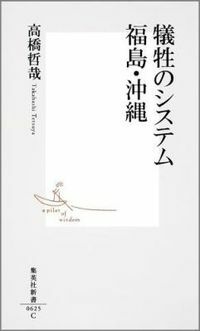 Takahashi Tetsuya （University of Tokyo） is one of contemporary Japan’s leading philosophers and public intellectuals. I’ve just finished reading his most recent book, Gisei no system: Fukushima Okinawa (The sacrificial system: Fukushima and Okinawa; Tokyo: Shueisha, 2012). It builds on Takahashi’s earlier work on the postwar Japanese social system as one grounded in systematic sacrifices and scapegoating. In other words, Takahashi finds in both Fukushima and Okinawa paradigms for the problematic structure of postwar Japanese society. Takahashi, who was raised in Fukushima, traces the ways this insidious logic led to the concentration of nuclear power plants in rural areas such as Fukushima, as well as to the concentration of U.S. military bases on the small province of Okinawa. Each is an instance of a kind of colonization, he argues, and each has been recently aestheticized and praised by national politicians as a kind of “noble sacrifice” carried out for the benefit of the nation. Takahashi is particularly good at tracing out the complexities of responsibility that lie behind the still-unfolding nuclear disaster in Tohoku. No one is completely innocent here, not even residents of Fukushima prefecture, and yet some people–particular those politicians, bureaucrats, scientists and industry leaders who formed Japan’s now-notorious “nuclear energy village”–bear particularly deep responsibility for the disaster. In one particularly interesting chapter, Takahashi unpacks the ethical implications of statements by such figures as Tokyo governor Ishihara Shintaro claiming the 3/11 disaster was “divine punishment.” Takahashi sees such claims as forming a particular kind of ideological obfuscation. He reads them in relation to earlier statements by the Christian intellectual Uchimura Kanzo writing in response to the 1923 Tokyo Earthquake and Nagai Takashi responding to the atomic bombing of Nagasaki. As Takahashi unpacks the logic of the sacrificial system, he never loses sight of the pressing ethical demand it posits. We can’t simply mourn the victims or celebrate the beauty of their sacrifice (as Takahashi notes, this was the dominant tone in coverage both in Japan and abroad of the workers who remained inside the Fukushima complex during the disaster, trying frantically to try to bring it under control). Fukushima and Okinawa instead demand that the sacrificial system as a whole must be dismantled.